Jump Guy is the top choice for Chicago bounce house rentals. Are you ready to get your party jumping? We have an amazing selection of themed bounce houses, water slides, interactive games, carnival games, concessions, tents, tables & chairs and much more! Jump Guy Inflatable’s and Games has over 25 years’ experience in inflatable party rentals and can host any event from a small back yard or block party, school & camp event to a corporate outing depending on your vision and the size of your venue. We are a family owned neighborhood business that takes pride in making sure we deliver safe bounce houses that are high quality and competitively priced equipment that will make your event a success! So if you're looking to breathe some life and excitement into your next party, make Jump Guy your first and only call! We're pleased to provide you with everything you need to transform your event into this year's biggest hit from inflatable bounce houses, giant water slides and combo jumpers, arcade games, obstacle courses, and photo booths. We take pride in working with each of our customers to help you design your ideal rental package for your event, and will guarantee prompt delivery, set up and pickup of your rental in the Chicago area. Please see our current up todate delivery area. Please enjoy our all NEW, user friendly website. We have created an easy online solution for you to plan your perfect party. Click, pick and pay all online at your leisure... it's that easy! We're happy to provide you with complete school fun day and church event services throughout Chicago, IL. You can rest assured you're always getting a product that's safe, clean and ready to lend itself to the festivities. Our team will take care of the setup and organization, as well as the takedown and transport, meaning you're guaranteed a seamless experience that results in your complete satisfaction. Jump Guy is here to put a smile on your face and the faces of your event's attendees! Jump Guy Party Rentals provides complete event planning and staffing services for our corporate clients looking to impress for promotional events and satisfy for customer appreciation days or compnay picnics. We have over 25 years experience and the resources to make your event a success, and more importantly, to make the process easy and seamless. Contact us today and let one of our professional event planners guide you through equipment selections, attractions, and share tips on best practices. If you're responsible for planning your group or company's next event, you'll want the experience and resources that comes with 25 years of putting up Chicago's best events. JumpGuy Inflatables & Games can assist you with your attractions, games, and equipment; that's a given, but what you really want is a partner that can offer up ideas and solutions that can make your job easier and ensure your event is a success. Contact us today and one of our event professionals will help you with a tailored event plan. If you have something special in mind for your event, we can also build a completely custom package that will meet your specific needs and budget. 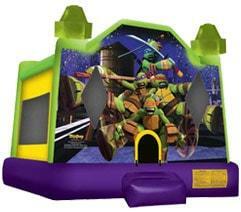 Hottest Inflatable Party Rentals in Chicagoland! 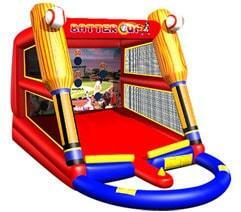 Jump Guy has Chicago's best selection of bounce house rentals that are America's favorite party and event attraction. Here you'll find a variety of character themes featuring your favorite cartoon and movie stars. You can also choose from popular party themes like birthday parties, halloween, and so many others. You can be sure your bouncer will arrive on time, cleaned and sanitized ready for fun. Book online now! 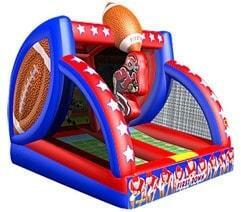 Combo bouncer rentals in Chicago are a great choice when you want extra fun and value. With these exciting inflatables, you get the popular bouncer and the additional elements like climb & slides, basketball hoops, and popup obstacles. 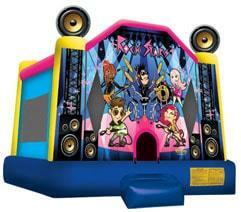 With a combo bouncer rental you get the best of both worlds all wrapped up in one awesome unit. We also have modular combos that you can customize with our interchangeable graphic banners. 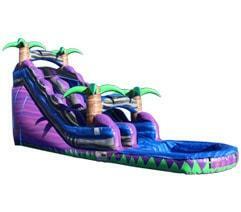 Jump Guy has the biggest, baddest inflatable dry slides in Chicagoland! 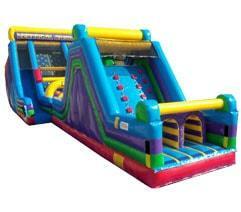 These giant slides are the perfect slection when you want to make a big statement with a centerpiece attraction. With just pure size alone, these large inflatable slides can be seen from quite a ways off and will draw attention where ever they go. Like the new "Vertical Rush"! 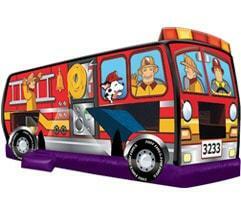 This giant inflatable is great for all ages and skill levels. Get ready for an awesome experience when you rent a water slide from JumpGuy.com. Our water slides are one of the most exciting attractions you can add to your event paln. Big, bright, and colorful these giant slides will have your guests lining up over and over again. We also have the classic "Dunk Tank" for good old fashion fun. All of our slides include the latest safety features like "No Jump" netting at the top of the slide. Our interactive challenge courses are a great way to bring your guests together in the spirit of fun and friendly competition as players race down dual lanes to crawl through tunnels, climb to the top of the wall to slide, and navigate through popup obstacles. These inflatable courses are also great choices for company team building events, church youth groups, and school fun days. We can configure the perfect course for you! Here is where the fun starts! Our interactive games are great for all ages. You'll find a wide variety of skill levels that are sure to fit your event perfectly. Sports games like Batter Up, Hoop Zone, and First Down Football are true crowd pleasers. We also have the new multi-player wrecking ball game! There's so much to choose from, so rent one or rent them all and create your very own carnival midway. See them all here! 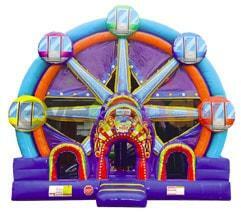 Create your own carnival midway at your next event with carnival game rentals from JumpGuy.com. These simple skill games have been a favorite attraction for young and old at local carnivals across the country, and now you can make that good old fashion carnival atmosphere at your event. Perfect for church fundraisers. When you need a little more room for extra guests at the table, or extra food service space, JumpGuy.com is the place to go for table and chair rentals. If you're looking to create magical outdoor celebration space, our elegant high peake tents are the perfect solution. Make sure everyone gets a seat at the table. See them all now! Our easy to use concession machine will add a touch of class to your party or event when serve up good old fashion "Fun Food"! Freshly popped popcorn, sweet cotton candy, and tasty Sno-Kones are all event favorites and you'll see your guests line up fast when you open your concession stand. Includes supplies where indicated. Nick and his crew were fantastic! They made our party at the high school a huge success! I would highly recommend this company for any event and we will be using him again! I rented the Mystery Machine Inflatable this weekend and it made my son's party a blast! We almost gave up on booking a bouncy house because other companies I had called didn't have availability or had extra delivery charges. Nick was super accommodating and the delivery guy was very friendly and helpful. Amazing, prompt service; tons of jumping/sliding/water options....it's a blast for the kids and they do all of the work. I would definitely recommend the jumpguy for all your party needs! We had a terrific experience with Nick--the inflatable was clean and the guys brought it right in and set it up promptly and expeditiously. Would use this company again for sure!